The Highbury Barn, carnival exhibition space in Victorian times. Description: After the Manor house had been destroyed in 1381 during the Peasant's Revolt, the grange and barn remained on the east side of the track that ran south to Hopping Lane, now St. Pauls Rd, roughly on the line of Highbury Park/Highbury Grove (the A1201). 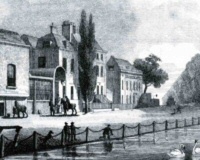 In 1740 a small ale and cake house was opened in the Barn, Highbury. 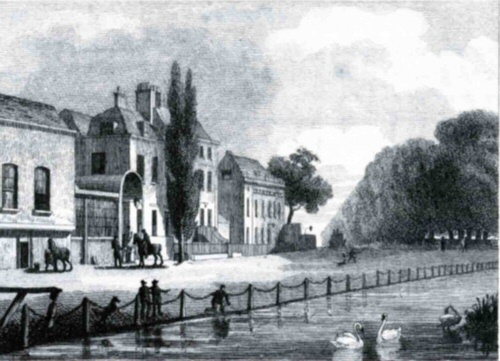 In 1770 William Willoughby took over Highbury Barn and greatly increased its popularity. He expanded its size and facilities, taking over land and buildings from the farm next door, reaching beyond what is now Kelvin Road and created a bowling green, trap-ball grounds and gardens. It could cater for company dinners of 2,000 people, concerts and dancing and became one of the most popular venues in London. Within a couple of years he had also obtained a dancing licence and in 1858 built the famous Leviathan. This was a 4,000 foot square open-air platform for dancing. It was lit by enormous gas globes and had the orchestra at one end. Admission was sixpence and it became an extremely popular venue with Londoners on Sunday evenings. In 1854 events at the annual balls in the grounds of the Barn included the aeronaut Charles Greens balloon ascent. By 1865 there was a huge dancing platform, a rebuilt theatre, high-wire acts (including in 1861 Jules Leotard), pantomime, music hall and the original Siamese twins. The Barn became the victim of its own success. Locals complained about the Barns increasingly riotous and bawdy clientele and acts. This led to a court case and in 1871 authorities revoked the Barns dancing licence.